Our last day in Rome and the last day of our holiday! We are ready to come home (especially our feet are) but sad that this wonderful time is coming to an end. We had planned a day out of the noise and crowds of Rome, but woke up to pouring rain. We spent a while looking through the guide book for a plan B and by the time we finished the rain had stopped, the sun was peeking through the clouds so we went back to plan A, which was to visit Ostia Antica – an excavated 1st century ancient Roman town, similar to Pompeii but a lot closer to Rome (and without the volcano). It was a bus, metro and train trip (less than an hour) and when we got off the train the rain was pelting down. Undeterred, as intrepid travelers, we opened our umbrellas (and waded through minor flooding by this time) and pressed on. It was the best thing we could have done because the rain eased within minutes of our entering the site, but it kept the tourists (mostly) away. Ostia Antica was a working class town, the main port for Rome, at its height home to 100,000 people. It’s a huge site (10,000 acres) and we thoroughly enjoyed exploring it. It had everything you could want in an ancient Roman town – houses, temples, tombs, a theatre, baths, shops, frescos, mosaics, statues (mostly without heads), even a forum, plus a few things we didn’t expect: apartment buildings, a bar, and a public toilet. It was even well signposted! You could wander freely over the site and we loved just poking around and exploring. One of the most fascinating sections was the Forum Delle Corporazioni (the Square of the Guilds), a monumental square lined with more than 60 offices of ship owners and traders. Along the pavement 2nd Century AD mosaics advertised the services offered by the various shops – shipping merchants, grain dealers, even ivory traders. It transported us back 2 millennia – it felt like a real town, where real people lived and worked and died. Very evocative and a great way to spend our last day. Well, today started fairly badly, improved slowly but finished up very pleasant. We got up early to head out for a big day in Rome. As we emerged from our room, there was a man in a suit waiting for us, saying he was very sorry they had made a mistake they should not have put us in that room. He didn’t seem to know the whole story of our multiple room changes so we filled him in. He promised us a much better room but said there were builders arriving today to convert the room we were in into an office, so we didn’t think we had much choice. So we walked to the new room which turned out to be the smelly room from yesterday! At that point we said forget it, we will find somewhere else to stay (and a few other things) and suddenly it was all OK, we could stay in the room we were in, the office would wait. A very dodgy operation, it seems, but this room is quite comfortable, and it would cost us half a day to find somewhere else & move so we stayed. But we worried all day whether our belongings would still be in the room when we got back (they were). We were still laughing (or maybe it was hysteria) when we finally headed out for our somewhat shortened day of sightseeing. 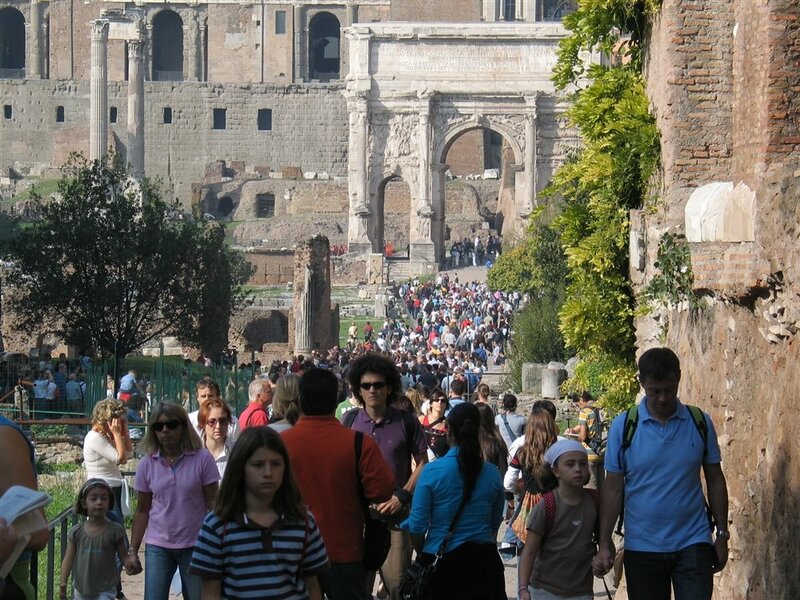 We planned to do the “Caesar shuffle” as Rick calls it – a day in ancient Rome. So we started at Palatine Hill, where the palaces of the Roman emperors used to be, and also the site of the earliest settlements in Rome. We were not willing to spend €9 on a guide book, and there were no maps or signs or information of any kind. Much of the site was closed for maintenance, so we wandered around for a while, with no idea what we were looking at, and gave up. The Roman Forum is one of the most famous ruins in the world, and with all the movies, books and even Shakespeare, it was really exciting to actually be there. Unfortunately we weren’t the only ones who thought that, and it was absolutely packed. And really hot! And the audio guide was really boring! We grumbled for a while, then found a shady corner, cooled down (literally and metaphorically), gave up on the audio guide and decided to ignore the crowds and try to get a feel for what it was like during the glory days of Rome. In the end we enjoyed our walk in the footsteps of the past. Right next to the Forum is the Colosseum. We found it easier than the forum to imagine it in its heyday - full of cheering crowds, blood sports, lions, slaves and gladiators. It’s such a familiar building, it is a thrill just to be there. We lingered for quite a while, just trying to cement the images into our memories. Next stop was Capitol Hill, location of the government in Roman times and still today. The main attraction was the views you get over the Forum, and when we got there it was late afternoon and the light was just right. Rick showed us a short-cut from there to the top of the Victor Emanuel Monument (the huge, white building that dominates the Rome skyline) for great views of Rome. We walked down the hill to the Pantheon, a remarkably well preserved Roman building and a marvel of Roman architecture. We would have been impressed with it on its own account, but were particularly interested because it was the dome which inspired Brunelleschi in his design of the Duomo in Florence – the first dome to be built in 1,000 years. In fact you can see a small square hole in the Pantheon ceiling where Brunelleschi was allowed to remove some material to analyse it. By now it was getting quite dark, and we soon found ourselves on Piazza Navona. Sadly the Fountain of the Four Rivers was covered with scaffolding, but the Piazza itself, which is quite large (it used to be a race track and is still shaped like one) was buzzing with street artists, buskers, hawkers, tourists and cafes. Quite a lively scene. We pressed on towards the Trevi Fountain. It is unusual for such a large fountain because the square it is in is small and no roads lead directly to it, so you just wander along small lanes and then, suddenly, there it is in all its magnificence (and a few thousand tourists too – at least 6 deep all around the fountain). We managed to manoeuvre our way to a good viewpoint and then sat in awe and just watched – the fountain and the people. Our feet were telling us they had had enough for one day, but we had to get to the Spanish Steps. We walked past some very smart shops, and classy restaurants till the crowds told us we had arrived. Again a lively, energetic atmosphere, with people just enjoying themselves, and sitting on the steps people-watching. We had been recommended to go to a restaurant nearby, so we obeyed – and were very glad we did. They do an antipasto buffet which is fabulous, so we piled our plates high and had a very agreeable meal to end the day. We were very relieved to find our room intact when we returned, so the day ended up on a much more positive note, and we are looking forward to our last 2 days in Rome. Well, what a day! Just when we were congratulating ourselves on how well we were managing and how smoothly everything has gone, pretty much everything went pear-shaped today. Let me tell you all about it! 10am: We had identified a bus right outside the hotel that went to the railway station so we thought we’d save the taxi fare and catch the bus. The bus stops in Siena have electronic indicators telling you which buses are coming next, and giving the whole day’s timetable for each bus and the closest place to buy tickets – very helpful. So we checked out the #13 to the station – next bus 1.30pm. You can’t hail a cab in the street, you have to go to a taxi rank, but there was none nearby, and the next bus to the city centre was a half hour away anyway (tip for next time – don’t try to travel on a Sunday in Italy). Fortunately the tourist map we had had a phone number for a taxi so we rang & one came quite quickly. OK, we thought, a bit more expensive but otherwise back on track. 10:30am: We queued for a train ticket to Rome – first train (the slow one) was at 12.30, and the fast train wasn’t till after 2pm. (We had gone online to try to prebook our train ticket to Rome, but the only option for ticket collection was “self-service” but Siena station has no self-service machine – there were trains every 30 minutes so we figured it was safe to just turn up – but apparently not on a Sunday morning!). There wasn’t time to go anywhere before the train came, so we sat at the station reading the Rome guidebook. 12.30: Got on the train which was very punctual. Though not without some anxiety as we were the only ones in the carriage and weren’t sure it was the correct train. However it was, and we had the carriage to ourselves to Grosseto, where we had to change for the train to Rome. (No wonder they have so few trains on Sunday – no passengers!). We had no idea what time we were due at Grosseto, or where it was (or where we were, for that matter), and there were no announcements. Shelley managed to emerge from the WC in the nick of time. 1:45: Sat on the platform at Grosseto for 45 minutes waiting for the 2.30 to Rome. We had booked seats for the second leg, in carriage 1, but had no idea which would be the front end of the train. Made an educated guess, which was correct, except carriage 1 was at the back of the train! Had to run the full length of the platform with our luggage, and as soon as we were on the train it departed – we have never held up an inter-city train before! The train trip itself was very comfortable and uneventful. 4.15: Arrived at Rome’s Termini Station. What a hectic place, very modern, lots of lights, shiny shops, and people. Rick had alerted us to pickpockets so Keith’s head was spinning trying to watch his back, and mine. Tried (and failed) to find the tourist information but bought a map and a weekly bus/train ticket and worked out where to catch the Metro to our B&B. Battled with throngs of people but managed to get on & off the metro at the correct place. 5:00 Wheeled our bags over cobbled roads to where we thought the B&B ought to be – no such luck. Wandered up & down for about 45 minutes, eventually found it (we had walked past it in the first 5 minutes). The quaint building has 2 separate staircases, so of course we chose the wrong one. Then the manager came down to find us and said he was sending us to a new B&B, much better for the same price. Sent us off with a woman who spoke less English than we speak Italian. She insisted we pay cash up front. Long “discussion”. Manager on the phone, said no problem, pay later. Took us to the room. Very nice except smelled like a toilet! We complained but she showed us how to open the windows. Didn’t help. Complained to the manager, very long story, 3 rooms later, several trips back and forwards, (by the way these rooms were in different buildings, a block apart), suddenly found us a very nice room, private bathroom, fridge, TV, all mod cons. Phew! About 8pm by this stage. 8.45pm: By this time we had given up our plans for an evening stroll through Rome, and thought we’d settle for a Pizza at a café we’d seen in the same street – of course it was closed. But ended up having a nice dinner at a restaurant just below our room. But in the end, we are in Rome!! Like the seasoned travelers we are by now, we managed to figure out the Siena bus system (we think) and caught a cute little bus into the Campo. Another glorious day with clear blue skies, so we queued up to climb the Torre del Mangia (City Tower) which promises “one of Italy’s best views”. After waiting half an hour and still not getting up to the ticket office (they only let 25 up at a time) we decided we could cope without it – considering Keith’s crook knees and Shelley’s altitude aversion we also decided we aren’t really tower climbing types really. (Like that ever stopped us!) Instead we had a wander around the Campo taking in the atmosphere. The Cathedral in Siena, also referred to as the Duomo, dates from 1215, and unlike Florence’s Duomo is packed with art, inside and out. Sculptures by Michaelangelo & Bellini, stunning frescoes, wonderful inlaid marble floors, towering green & while marble columns, painted ceilings, a spectacular carved marble pulpit by Pisano, medieval stained glass – it’s quite an overwhelming sight. We were fortunate to see the inlaid marble floors, because they are covered for most of the year, and are only opened in September & October. Some of them were still covered, much to our disappointment, but the ones we saw were extraordinary enough. One of the most beautiful features is called the Piccolomini Library. Piccolomini was a Sienese-born Pope (Pius II) and the library, a large room tacked on to the side of the nave to house his extensive collection of books (now lost), is a feast for the eyes. Brightly coloured frescoes cover the walls and ceilings, which are just superb. The detail in the pictures is amazing, and the colours are so rich it could have been done yesterday (actually 1502 – and not cleaned or retouched since). We dragged ourselves somewhat reluctantly out of the Duomo (the rest of Siena’s “must-see” sights awaited). Next door is the Duomo museum, housing the treasures from the Cathedral. Some incredible objects, notably a large painting of the Madonna from 1311 (a masterpiece of medieval art), the original stained glass window from the cathedral made in the 13th century, sculptures by Donatello & Pisano. The building itself is interesting. The Siena cathedral was intended to be much bigger, and one wall and some columns of the planned building were completed before the plague stopped the work. Some of the columns were filled in with later brickwork, and that is the home of the museum. You can see part of the columns in the corners of the walls. There is also one wall of the abandoned building (the facciatone) which you can climb on for great views (so much for avoiding steps and high places). Actually it was very safe but really scary – maybe something to do with it being only the thickness of a wall (well, a thick wall, but still …) but the views were really great. Across the Piazza from the Duomo is Santa Maria della Scala, which was a hospital and almshouse from the 12th century until the 1980’s. The main attraction is a huge hall filled with frescoes from 1442 detailing medieval Siena’s innovative health care and social welfare system. By now we were getting pretty tired, but we had bought a combo-ticket so had to get our money’s worth. We visited the baptistery, unusually situated under the end of the cathedral (because of the steep site, the entrance is at street level). Sumptuously decorated, with striking font including bronze relief panels made by Donatello & Ghiberti (he did the famous panels on the door of the baptistery in Florence). One last morning in Florence and one more “must-see” museum – the Museum of San Marco. This museum is in a Domenican monastery built in the 14th century, and decorated with dozens of frescoes by Fra Angelico (and others) a Dominican Friar who was one of the most important painters of the early renaissance. The theology & chronology of the work is a bit of a worry (St Dominic features in every scene, even the crucifixion) but the art is wonderful and it’s great seeing it in the place it was created and intended for. We bussed back to the centre of Florence and walked back to our hotel, after a quick perusal of the Mercato Nuovo (markets). This is the location of Il Porcellino, the bronze pig of which there is a copy outside Sydney Hospital. Caught another bus (they have these really cute short electric buses which are great except they make no noise so can sneak up on you when you’re walking on the so-called pedestrian friendly streets) to the Bus Station, where we caught a bus to Siena. We felt like temporary locals, using public transport – and the bus was hot, crowded and bumpy - I think we’ll stick to the train in future. When we arrived in Siena, we were dropped off in the street (no bus station, tourist info or anything) so we had fun trying to figure out how and where to catch a taxi. (We had to get a taxi to the hotel because we had no idea where it was). At the hotel no-one seems to speak English, so our 3 words of Italian are getting well and truly tested. 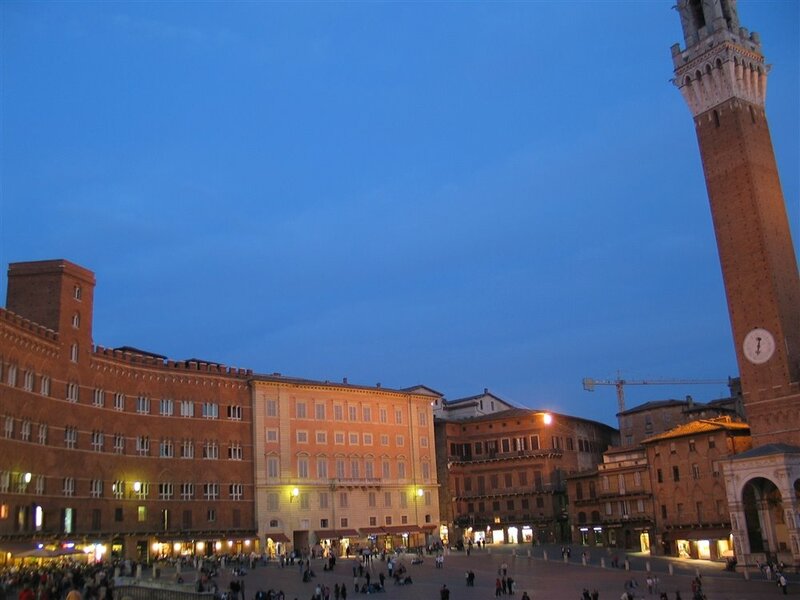 We walked into the Centro Storico (historic centre) to see the Piazza del Campo (it was about 7pm and dark). One of the most famous “squares” in the world, it is a huge fan-shaped space set on a slight slope, which is the centre of social and political activity in the city. It was full of people – students, tourists, families, people sitting, strolling, playing soccer, and taking photographs. 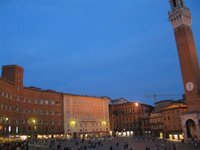 We found a nice restaurant and had dinner (off the Campo) and had an early night – with only one day to “do” Siena, it will be full on tomorrow. Today we realized we only have one full day left in Florence, and set ourselves an agenda to “do” the rest of the must-see sites – the Piazza Del Duomo with its Cathedral, Baptistery, Cupola (the Duomo) and Museum – plus the Bargello Museum, and other sites. And we succeeded, despite sleeping in till 9am (we love shutters)! In fact we managed to finish the day with night-time views over Florence, followed by a very nice dinner. Piazza della Signoria. This is an outdoor terrace attached to the Uffizi Gallery, which holds a number of Renaissance sculptures. Some large and very impressive works. Bargello Museum – showcases Italian Renaissance Sculpture, including one of the most famous of all, Donatello’s David. Excellent collection, and slightly off the main tourist agenda, so not crowded at all. The Baptistery – once the building where all Florentines were baptized, it is a Romanesque building that dates from the 11th century. It’s an elegant building in the “Florentine Style” – green and white marble in geometric designs, but has two striking features – its doors, with their 3-D bible stories, and a dazzling mosaic dome ceiling, which we really loved. The Cathedral of Santa Maria dei Fiore (usually referred to as the Duomo, because of the spectacular dome). The exterior is stunningly beautiful, but the inside is relatively plain. It is huge (the second largest church in the world, after St Peter’s in the Vatican) and imposing but mostly unadorned. The Duomo – it was time to climb the dome itself. All 463 steps to a tiny cupola on the top. It certainly got the heart pumping, but was well worth it. You get to access a gallery inside the dome, which gives a great view of the church, the fabulous painted ceiling inside the dome and the stained glass windows. Then you keep climbing, up increasingly narrow and steep stairs, to the cupola, for superb views of Florence. Wow!! The Duomo Museum. After sitting on a bench in the Museum’s air-conditioned interior to recover from the dome climb we had an enjoyable wander through this excellent museum, which contains treasures from the cathedral dating back to its early days. Fortunately with each change in the cathedral décor, someone had the foresight to keep the discarded items and they are now preserved for us to enjoy. These include choir galleries (including one by Donatello), sculptures, stone reliefs, and the actual tools used by Brunelleschi (who designed the dome). Piazzale Michelangelo, an elevated terrace with superb views of Florence. (The only problem with the view from the Duomo is that the Duomo, Florence’s most recognized landmark, isn’t in it). We got there in time to watch the sunset and the lights come on – wonderful. Dinner – we headed to a restaurant recommended by Alessio but when we got there it looked a bit posh (ie expensive). Instead we went to one nearby which turned out to be excellent, really great food, quite upmarket but not expensive. We lingered over our meal and then walked back to the hotel. It was certainly a pretty area, with the typical Tuscan countryside – ochre-coloured villas with red tile roofs, olive groves, vineyards and cypress trees, and blue, blue sky. We took a walk around the town, past Etruscan ruins, a Roman amphitheatre (which we were too mean to pay €9 to see), and a lovely park, up to a hill-top convent (closed for lunch) and then to the look-out – wow!! What a view – a huge panorama of the surrounding hills down to Florence spread out in the valley. The photos don’t do it justice at all. Then back down to the town past a shop full of gorgeous Tuscan pottery (well, to be truthful, we didn’t exactly go right past it), and to a terrace restaurant for lunch. This is what holidays are about! The walk was rather steep in parts – it turns out the reason they call these Tuscan towns “Hill Towns” is because there are hills there! We were having so much fun that we decided we’d walk to the next town and catch the return bus there. “1km easy downhill walk” the brochure said. Well, it would have been 1km and all downhill if we hadn’t taken the wrong path for the first 20 minutes, and it was easy in the sense of on a road and downhill, but parts of it were really steep! Very scenic though, and we got to peek through the gates of a few exclusive villas. We caught the bus back to Florence, but got off at the first stop because we spotted even better views out the bus window. Took more photos, and caught the next bus back. A very pleasant and relaxing day – hopefully now we’ll have the strength to tackle Florence tomorrow. Florence is the first place we have really struggled with the crowds, not to mention the motor-bikes! An early start this morning – we had a booking at 8.15am at the Uffizi Gallery! The alternative was queuing for a couple of hours (when we arrived at 8.15 the queue was already quite long) so it was worth the early start to avoid that. The Uffizi is, of course a very famous gallery, and home to a wonderful collection of Italian painting, with works by Giotto, Botticelli, Michelangelo, and more. The gallery is arranged chronologically, so you get to see the progression from Byzantine art, through the renaissance and so on. Very educational (I mean that in a good way) and it’s so exciting to see these works in the flesh, as it were. There was also a bonus which was an exhibition about the mind of Leonardo da Vinci, which was fascinating, and unexpected – lots of models, computer simulations & original drawings showing different aspects of the way Leonardo’s mind worked. In the afternoon we had our second booking, which was at the Accademia, home of one of the most famous art works in Italy, the huge statue of David, by Michelangelo. It’s so familiar, but seeing the real thing is quite a powerful experience. There are a few nice paintings there too, but the other pieces we really liked were some unfinished big sculptures by Michelangelo. Each one really looked like someone trying to escape from a block of marble. You could clearly see the chisel marks, and get an inkling of the process of creation (to make a sculpture of an elephant you just chip away all the bits that don’t look like an elephant). We walked down to the church of Santa Maria dei Fiori, better known as the Duomo, because of the large and beautiful dome. It was too late to go inside, but thought we’d have a quick look at Florence’s most famous building. It is really enormous, wherever you are in the old city centre you can usually still see the dome. The exterior is made of white, green & pink marble, and is really quite beautiful. We also got to see the famous doors of the Baptistry, which were a major breakthrough in perspective when they were made. After a pleasant dinner at another local restaurant recommended by Alessio – (not as nice as last night but good and very inexpensive) we decided we had earned an early night. We said a sad goodbye to Venice this morning, but not before a little shopping expedition. There is so much to buy here its quite overwhelming. Actually being on a tight budget makes it so much easier – if I had more money to spend I don’t know how I would decide what to spend it on! But we had picked out a couple of not-too expensive souvenirs on our wanderings, and succeeded in finding our way straight to the same shops again to buy them. Getting lost in Venice was one of our aims, and we managed it quite well a couple of times, but actually finding the same place twice is a challenge. So, our last Vaporetto ride to the railway station, then a train to Florence. A very painless journey (made even more so by both of us sleeping most of the way – sightseeing is very exhausting). We walked a few blocks from the station to our hotel – past narrow alleyways of medieval streets full of very, very expensive shops (designer boutiques, mostly – gorgeous stuff). One shop had a price list (in Italian of course) in each window display, and we entertained ourselves trying to work out which item in the window was worth the top price (in the thousands of Euros). Our hotel is tiny, only 8 rooms, on the second floor of an old building, but the room is quite nice (we have a view of the light well, but there is a mirror outside the window so we can see the sky!) and the hosts, Alessio & Asumi are lovely people, who gave us lots of helpful advice when we arrived. The location is great – very close to the Ponte Vecchio, no more than 10 minutes walk from the main sights, and on a bus route if we want to venture further afield. On Alessio’s recommendation, we took a stroll on the less touristy, south side of the river. Lots of lovely little shops and galleries with antiques, pottery, painting etc, and we also passed a number of artisan’s workshops – not open to the public, but on street level so we peeped through the open doorways. We chose one of the restaurants Alessio had recommended, and had a great meal – gargantuan servings, really tasty, sitting outside on the piazza – we even had an accordionist stroll by & play for us. The restaurant was packed, so we shared a table with an English couple and shared travel stories. I think we’re going to like Florence. One of the famous places in Venice we hadn’t made it to yet was the Doge's palace. The Doge was the elected ruler of Venice for about 1000 years, and the palace was his residence but more importantly also the house of government. Its exterior is striking, with patterned pink and white marble and elaborately carved façade, but the interior is incredibly ornate, with richly decorated ceilings and priceless artworks. Its design was intended to tell the world how wealthy and important Venice was, and you could really see what an impact it would have. The senate room is one of the largest rooms in Europe and it contains Tintoretto’s Paradise, allegedly the largest painting on canvas (74 feet by 30 feet). If it was all designed to impress, it worked. The famous Bridge of Sighs connects the Doge's Palace with the Prison next door, which we also had a look around – quite a contrast with the richness of the palace. One of the most remarkable displays was the Armory, full of vicious weapons arranged very artistically. Next on our must see list was the Frari (short for The Basilica of Santa Maria Gloriosa of the Friars), a huge church which features the work of three great Renaissance masters: Donatello, Bellini, and Titian. It's unusual seeing art “in situ” rather than in a gallery; there are some impressive works there, we particularly liked the John the Baptist wooden sculpture by Donatello. One of Venice’s lesser known areas is the Jewish Ghetto. The word Ghetto itself derives from Venice – in 1516 a law was passed in Venice confining Jews to a small island which was the site of a foundry (a ghetto). They were confined at night and the bridges were guarded. The island was so small, that they lived in apartment buildings 6 stories high – unusual for Venice – which still distinguish the area today. Napoleon gave the Jews back the freedom of the city, and today there are few Jews living there, but the area retains a Jewish culture with synagogues, a Jewish museum, shops and a kosher restaurant. At its height, around 1650, the Ghetto housed about 4,000 people in a space roughly equivalent to 2½ city blocks. Before World War II there were still about 1,300 Jews in the Ghetto, but 289 were deported by the Nazis and only seven returned. We had an enjoyable stroll through the area, and were touched by a moving holocaust memorial in the main square. Before visiting the Frari we stopped for a pizza at a little Trattoria nearby – it was a really great pizza, but the people at the next table were eating a “fish soup” that looked really tempting, so we booked to come back for dinner. Well, the soup was excellent, brimming over with all sorts of crustaceans; it was much more than a soup. When we arrived the waitress seated us and said “Two fish soups, then?” It made us feel like locals! It wasn’t totally crazy to go back to the same restaurant – our next destination was next door to the Frari – the Scuola Grande di San Rocco, a 16th century building whose walls and ceilings are covered in paintings by Tintoretto – the crowning achievement of his career, they say. We went there for a musical evening of Vivaldi – the art was a bonus. We sat gaping at the ceiling for most of the evening. Vivaldi was Venetian, and there seems to be performances of The Four Seasons on every night somewhere in Venice, and we thoroughly enjoyed our last evening in this amazing city. Another cold, grey day, so we thought we’d do an island cruise. (True!) Well, it’s going to stay cold and grey the whole time we’re here, so we decided to do the trip anyway, because we wanted to see some of the islands in the Venice Lagoon. The whole trip can be done by vaporetto, so it’s a cheap outing. It ended up raining all day, which did detract a little, but it was still a fun day. First stop was Murano, the island famous for its glass. Venetian glass-making was moved to Murano in 1291 because of the risk of fires, and since then they have been famous world-wide for their glass. Venice is full of glass shops selling everything from tiny animals and beads to enormous and incredibly gaudy chandeliers, and some stunningly beautiful pieces in between. Murano itself wasn’t much to look at compared to Venice, but its attraction is the glass. We visited the Glass Museum, containing some beautiful pieces, some dating back 2000 years. We also visited a glass factory to watch glass-blowers at work – we watch 2 men making a vase, working together like a well-oiled machine – very impressive. We also wanted to visit the Church of Santa Maria e San Donato, because of its mosaic floors dating to 1140 – but it was closed from 12-4. No worries, we thought, we’ll come back later. Back onto the vaporetto we headed for Burano, a tiny island where the houses are all painted different pastel colours, allegedly so that fishermen can find their way home in the fog. Burano is also famous for fishing and particularly for its lace, which is highly sought after. We visited the lace museum, which was very instructive, and were fortunate to find a couple of Buranese women making lace (it’s all done by hand and looks incredibly difficult). We wandered all over Burano (I said it wasn’t very big), it’s a delightful spot. The next island we called in on was Torcello, once a town to rival Venice, but now mostly swamps and only about 20 people live there. But it is the site of the Church of Santa Maria Assunta, which was founded in 639 and still has most of its 11th & 12th century Byzantine structure standing, especially some outstanding mosaics. There is also a bell tower which you can climb to get a great view - or so we’re told – given the ongoing rain and fog, we didn’t think we’d bother. So, back on the vaporetto to Murano to see the Church of Santa Maria e San Donato which we had missed before. It was about 6pm, so we were there well before it closed – but it was Saturday night and a mass was about to start, and tourists are not welcome during mass! We sat quietly in the back row for a little while, but only got to see a small portion of the floor – which did look impressive. Add it to the list of places to revisit one day. We had passed a nice restaurant on Murano on our first visit, and planned to have dinner there. But when we went back neither of us could remember where it was! And we were too tired to walk down every street till we found it, so caught the next vaporetto back and had dinner in a nice place just down the canal from our B&B. After a leisurely breakfast chatting to fellow guests we headed out for a day of wandering in Venice. We hadn’t got past the top landing when our hostess said we couldn’t go out! The water outside was halfway up to our knees – there was an extremely high tide (Aqua Alta), and many of the fondamenti (streets along canals) were under water. She produced some waterproof boots in our sizes and we set off again. Our plan had been to head for a travel agent we had found the night before to book our train tickets to Florence, but instead we splashed our way to Piazza San Marco to see it under water. They had duck boards up for all the masses of people to walk along single file, while we got to walk straight through. We thought it was great fun, but I’m sure it’s a major pain for the locals. We felt like little children splashing about in our Wellies. We eventually made it to the travel agent to learn that the “system is down” (a perennial excuse) and they couldn’t book our tickets. So that was a bit of a wasted trip – except that walking through the streets of Venice is fun, wherever you’re going. On the way back we visited the Scala del Bovolo (Snail Staircase) an unusual external spiral staircase built in 1499. Very striking, and unusual in that it mixes Gothic, Byzantine and Renaissance architecture. After changing back into our shoes we headed back up the grand canal on the Vaporetto to a palace called Ca’ Rezzonico. Ca’ (short for casa = house) is what the palaces were called, because only the Doge (the duke) was allowed to have a Palazzo! Ca’ Rezzonico is now a museum of 18th century Venice and one of the few palaces you can see inside of. The 18th century was Venice’s hey day, when it was the richest city in the world, and the residents had too much money. The museum was full of ornate baroque furniture and incredible paintings and ceiling frescoes – a glimpse into the daily life of the rich and fabulous in Venice in the 1700s. It was one of the best presented museums we’ve been to, with a floor plan and a “you are here” in every room, directions where to go next and very informative multi-lingual descriptions in every room. Well worth the visit. Back on the vaporetto (the Grand Canal looks even better in the twilight) intending to have dinner somewhere near the Rialto Bridge. We sat down and left two restaurants (too noisy, too touristy) and finally ended up in a very cheap & cheerful place on a small square off the main drag. The menu consisted of 3 types of pizza & 3 types of pasta but it was very tasty and very cheap, and we were entertained by a busker playing classical guitar in the square. We followed up with a coffee in a 250 year old café with lots of character - a perfect meal. The first place everyone goes to in Venice, the most famous piazza in town is St Mark’s Square, or Piazza San Marco, so along with every other tourist in Venice (or so it seemed) there we headed. Napoleon called it “the finest drawing room in Europe”, and it is quite beautiful, despite the crowds and the pigeons. Enclosed by historic buildings, including the striking Basilica San Marco, it is a wide open space which contrasts with the narrow alleyways and canals of the rest of the city. The shortest queue seemed to be at the campanile, so that was our first stop. It’s a 300 foot high bell tower which (to our great relief) has a lift, and offers great views of Venice. It was really cold up there, but otherwise great – the views are excellent, and it was good to orient ourselves on our first morning. Then after a detour to buy concert tickets we went into Basilica San Marco itself. What an incredible building. It was built to house the purported bones of St Mark the apostle, stolen from Alexandria in 828. The façade is incredibly ornate, with mosaics, marbles of many colours and stone carvings. Inside it is even more stunning – with 8000 square metres of mosaic (much of it gold) covering the ceilings, domes and arches and elaborate mosaic and tessellated marble floors. There is a little museum containing some beautiful gold and jeweled items (chalices, lamps, icons & more from 1000 and more years ago) and a large collection of “relics” – mostly bones of various saints housed in special containers which were a little too anatomical eg leg bones with a silver foot attached – quite a gruesome little collection. In contrast is the Pala D’Oro, a glorious altarpiece created over several hundred years so that it has elements of the Gothic as well as the Byzantine. The Pala d'Oro is made of gold and is set with enamels, jewels, semi-precious stones and pearls – quite a sight! Next we took the vaporetto to the famous Rialto Bridge. It’s a busy spot with lots of shops, tourists, gondolas and other boats, but we managed to find a spot next to the water to sit for a drink and soak in Venice. Somehow we managed to bump into the only other people we knew in Venice (the Aussies from the shuttle bus in Paris). We nursed our drink and sat for as long as we could get away with, before finding a little out of the way Trattoria for dinner. A night-time stroll back to our B&B was a pleasant ending to the day – we try to take a different path each time, and always make it back eventually. We were being picked up at our hotel at 3 to go to the airport, so we decided to stay within walking distance and not risk getting caught in traffic and missing the plane. Fortunately there is a lot to do within a few blocks of the hotel. Although we were quite dubious about the hotel, it turned out to be quite good. Very shabby but our room was really quiet, and it was very clean. And it was a great location. We had been recommended to go to the Musée des Arts et Métiers (thanks Carolyn) which happened to be only a block away. Think Powerhouse Museum, only about 400 years worth of history, several times larger and more of everything. It has been a museum since1794! A very impressive museum and hardly a tourist in sight. We saw landmark items like Lavoisier’s (the father of modern chemistry) Laboratory, Daguerre’s (as in Daguerreotype) camera obscura, Pascal’s mechanical adding machine. Science buff heaven, but enough to interest anyone. Fascinating, we were very glad to have gone. Nearby is a clock called Le Defenseur du Temps, a dramatic automated clock in which “the defender battles earth air and water in the form of savage beasts to the sound of earthquakes, hurricanes and rough seas”. We sat at a café and readied ourselves for the spectacle – it took us about 20 minutes to realize that although the clock was “ticking” (the dragon was “breathing”) the time had not actually advanced at all, so that was a big non-event. But the big excitement was seeing the house of Nicolas Flamel (famed alchemist and creator of the Philosopher’s Stone), built in 1407. (He wasn’t home, by the way). Our walk back to the hotel took us past the Pompidou Centre, that inside-out building that houses the Museum of Contemporary Art. We didn’t have time to go inside, but the building itself is striking, and we sat and ate our cheese roll next to the strange and modern Stravinsky Fountain. It looked somewhat the worse for wear and several hoses were disconnected, but was a popular spot, with lots of people sitting on the steps and in cafes nearby. We made it back to the hotel with about 10 minutes to spare before the shuttle arrived. It was a good hour and a half drive to Beauvais Airport, through the centre of Paris, so we were very glad not to be driving. We met a nice family of Aussies in the shuttle who we traveled to Venice with, so the time passed quickly, but it was a long journey all up for a 90 minute flight – drive to Beauvais, wait around for plane (we were already queuing to board when we saw the plane land from the previous flight! ), fly to Treviso, bus to Venice, then Vaporetto (water bus) to our stop, then a walk to the B&B – 7½ hours in total. But all the transfers went very smoothly, and when we arrived we found a wonderful room, a friendly host who made us a timely cup of tea, and a tiny balcony with a view of the canal. Our last full day in Paris, and we decided that we would not try to “do” or “see” anything but rather just “be” in Paris. We caught a bus to the Place de la Bastille. The Bastille of course was destroyed in 1789 (the original Bastille Day) but you can see the outline of where it was on the street. From there we wandered through the Marais, the area described by Rick as “Paris at its best, with the body of yesterday and the pulse of today”. We had breakfast on the Rue St Antoine, once one of the grandest streets in Paris. We passed through the courtyard of the Hôtel de Sully in to the Place des Voges. (Hôtel means mansion). Apart from the cars and TV antennas it’s easy to imagine the graceful elegant lives of those who built these mansions (at least for the ‘upstairs’ folk, anyway). In the centre of the Place des Voges is a delightful garden, with a statue of Louis XIII on horseback in the centre, lovely trees, fountains and (of course) lots of benches. We parked ourselves on one of those (after a detour to a boulangerie, as you do) and just enjoyed the moment. One of the houses on the square holds an apartment where Victor Hugo lived and died. As a museum it was mildly interesting (especially if you couldn’t read the French labels on everything) but we enjoyed having a peek inside one of the mansions. Nearby is another mansion (a very grand one) which is now home to the Carnavalet Museum of French History. Again in French, but we spent a pleasant hour there, picking up what we could, and enjoying being away from the tourist throng. Still in the Marais, we walked through the Jewish area. There was a distinct change from designer jewellery shops & boutiques to suddenly find ourselves in a completely different culture. The streets were narrow and cobbled, and free (mostly) of traffic, with little delis, cafes, and bookstores, and families strolling. We stopped for a traditional Falafel for dinner, and though it was getting late the shops were all still open and the streets were lively. A really enjoyable day, and we felt we achieved our aim of just appreciating being in Paris and experiencing the romance and beauty of one of the world’s great cities. Today was a beautiful, sunny summery day, with clear blue skies and we took ourselves on a tour of historic Paris, based on & near the Ile de la Cité, which is the island in the middle of the Seine and where Paris began. We began at Notre Dame, one of the most impressive gothic buildings anywhere. It took 200 years to build, and you can imagine how impressive it must have been to a medieval community. The ceiling of the central aisle towers 10 stories high above you, and apparently the church can hold up to 10,000 people. There are beautiful stained glass windows, and we particularly liked the impressive carvings on the choir area. Over the years and through the revolution it had become run down and damaged, but was extensively restored in the 19th century. We climbed a winding, worn stone staircase (in the footsteps of Quasimodo) up one of the bell towers to check out the many gargoyles and the stunning view of Paris. 400 steps! (Haven’t these people heard of escalators?) But it was worth it. The view is incredible and you get the best photos of Paris from there. Walking around the exterior of the cathedral you can see the ingenuity of Gothic architects in the enormous flying buttresses that took the weight of the stone roof and enabled the construction of higher and higher walls, which left plenty of room for large areas of stained glass. Behind Notre Dame is something completely different, a memorial to the 200,000 French citizens (Jews, gypsies, political opponents etc) who were deported during the war by the Nazis and never returned. It’s a moving memorial, designed to draw you out of the light and into an underground space that echoes the conditions in the ghettos and camps. There is a tunnel lined with 200,000 tiny lights which gives in a small way a sense of the huge numbers of lost lives. We crossed the Seine and entered the Rive Gauche (Left Bank), and it was like a different city. On the right bank are wide boulevards and lots of busy people, on the left bank the streets are narrow and winding, there are bookshops, cafes, lots of different ethnic shops (Greek, Chinese, Japanese, Tunisian …) – still the favourite haunt of struggling writers and artists, and people coming to Paris to “find themselves”. We saw the oldest tree in Paris, planted in 1602, and the oldest church in Paris (now a Greek Orthodox church). Back to the Ile de la Cité to the church of Sainte Chapelle. Built to house the supposed Crown of Thorns bought by Louis IX in 1239 from the Emperor of Constantinople, allegedly taken to Byzantium (Constantinople) by Constantine’s mother in around 300AD. This relic, which if not the “real thing” is at least really ancient, is now housed at Notre Dame (it was taken from Sainte Chapelle during the Revolution) and brought out once a year for Easter. King Louis was a very religious man and later became St Louis. He certainly built an impressive house for his relic – it’s like a huge jewel case, with massive stained glass windows held together by as little stone as was necessary to hold the building together. You enter up a narrow spiral staircase, and the richness of the stained glass quite takes your breath away. Back to the Latin Quarter for dinner (our first bad meal in France – Shelley’s dinner smelt so bad we sent it back – but it was cheap!). But the atmosphere and the people-watching was fun. We hadn't quite finished our historic walk, but we have worn ourselves out so headed back to the hotel for an early night. A very fun morning – at a laundromat (Keith) and an Internet Café (Shelley). Both of us had complications – too boring to write here, but the exercise took all morning. Still, the clothes needed cleaning, bills at home needed paying, and we had to update this blog. We spent the afternoon at the Musée D’Orsay, which houses French Art from 1848 to 1914, picking up where the Louvre leaves off. It showcases the development of impressionism, post-impressionism and contains some very famous works, such as Manet’s 'Déjeuner sur L’Herbe' and Renoir’s 'Dancing at the Moulin de la Galette'. It is housed in a converted railway station, and it is worth visiting just to see the building itself. We stayed till they threw us out at closing time, we could have stayed a lot longer. The time had come to visit Paris’s most famous landmark – the Eiffel Tower. We had been waiting for a clear day (the weather has been great, but there seems to be a constant haze) but decided we’d better just go in case the weather got worse. Also we reasoned the crowds might be less if the conditions weren’t great (ha!). Perhaps the crowds were less than usual, but we still had to wait an hour for the lift. We were hoping to get to the top in daylight and watch the city lights come on, but by the time we got to the top it was dark. However Paris at night from 900 feet is something to behold. We spent time on each of the three levels, which offer different views and also exhibitions about the tower itself. It is an amazing structure, stunningly beautiful, in an industrial kind of way. It’s much bigger than you expect, and quite an engineering marvel in its day. By the time we got to Level 1 the crowds had disappeared and we sat and had a cuppa with Paris at our feet. By the way, 900 feet is very very high! And as you may know I (Shelley) am not very fond of high places. All the way up in the lift I was asking myself why??? But I was in Paris, so I just had to do it. And when I got to the top I was so mesmerized I forgot to be afraid, possibly assisted by the fact that you can’t see the ground from there. And when we got down to the second level it didn’t seem very high at all. Back on earth we wanted to try to get a good photo of the tower at night, so wandered across the river to the Trocadero. There we found 2 Jamaican men (? buskers) conducting a sing-along of Beatles songs with a group of people sitting on some steps with a wonderful view of the Eiffel Tower. We joined them for a while – it was somewhat surreal to be singing in English with Jamaicans in Paris. This morning we bought ourselves a picnic brunch and headed for the Tuileries Gardens. On the way we passed a very modern group of buildings, which turned out to be a kind of upside down shopping centre – from ground level all you could see was glass skylights, and the shops went for 3 levels down, with a central courtyard. We did a bit of shopping (bought some very French items – made in China). The Tuileries are the gardens of the previous Tuileries Palace, which is no longer there. Lovely fountains, flower beds, lots of statues and wide boulevards to stroll. We found some chairs near the fountain and ate our picnic. This park again was full of people – the French (and the tourists) clearly love their parks. What is left of the Tuileries are a couple of "garden sheds". One of these, the Orangerie, is now home to an impressive collection of mostly impressionist paintings collected by an art dealer in Paris in the early part of the 20th century. The main reason we went there was to see Monet’s Water Lilies paintings, a collection of eight huge canvases which he did as a gift to the country in his latter years. The Orangerie has been closed for the past 6 years while they built a special floor to house them, and it only opened in May this year. We had read about it in the SMH so were keen to go, and it was well worth it. The Water Lillies were stunning, big enough so that you could lose yourself in the image, and worth the visit just for that. Next to the Orangerie is the Place de la Concorde, at the bottom of the Champs Elysées, home of the tall Egyptian obelisk and site of the guillotine. From there we caught a bus along the Champs Elysées, which must be one of the most famous – and the busiest streets in the world. With the traffic the bus trip took a while which gave us plenty of time to ogle. We got off at the Arc de Triomphe, and discovered, to our relief, an underpass to get across to it. I was sure I heard there was a lift to get to the top, but when we got there there was a sign clearly saying stairs only, so we trudged up 284 steps to the top. The museum at the top is undergoing renovation, but we went out on the terrace to check out the view. It was a hazy day but the most impressive part of the view is the 12 converging boulevards. And as we were leaving we discovered the lift!! Oh well, at least we didn’t have to walk down the 284 steps. We strolled back along the Champs Elysées and found a café (not difficult – there are one or two). Not only is the road wide (5 lanes in each direction), but the footpaths are at least as wide again as the road. Which is a good thing considering the number of people there. We sat at a table then spent a pleasant hour or so people-watching while we waited for a waitress. After all those stairs it was nice to sit for a while. Our next stop was the Marais area, an area once favoured by the bourgeoisie, but now full of chic boutiques, elegant cafes and art galleries. A lovely area to wander – which we did because we got lost looking for the Place des Voges (Paris’s oldest square, built by Henri IV in 1605-1612), and then waylaid in a really lovely jewelry store with a very persuasive salesperson (there goes the budget!). We found a nice restaurant on the square for dinner, after a stroll around the square, looking at the galleries (with serious money, you could buy some lovely pieces here!). We’ll have to go back in the daytime to take some photos. Since Paris is as lovely by night as it is by day, we went on a cruise on a Bateau Mouche, a huge boat with really strong spotlights that illuminate the banks of the Seine (including lots of couples out for a nice secluded walk along the river). Rather chilly but otherwise a very pleasant way to see the city. We took the 10.30pm cruise – no such thing as an early night here! Our first day in Paris – wow! Paris is so – well – Parisian! We started as we intend to continue, with a late breakfast/brunch at a sidewalk café. We had downloaded a Paris walk from National Geographic and that seemed like a good place to start. It sent us to the St-Germaine-des-Pres area on the left bank, the heart of the Latin Quarter. It’s still a buzzing neighbourhood, home of the Sorbonne, with lots of cafés, bookshops and designer boutiques, and it still has a youthful and edgy feel. We lingered at the café, people-watching and strolled for a while, till we found ourselves in the Luxembourg Gardens, a gorgeous park filled with trees, superb flower beds, statues, fountains, walkways – and lots of chairs. And people – strolling (the tourists) and sitting on the chairs in groups talking (the Parisians). So of course we had to act like locals and found ourselves a scenic spot to sit and enjoy the atmosphere. Close to the Gardens is the Pantheon, a huge neo-classical monument. It started out life as a church, but since the revolution it has been used to house the tombs of French VIPs (such as Victor Hugo, Emile Zola, and Pierre & Marie Curie. It is also the home of Foucault’s Pendulum, and the site of his famous demonstration, in 1851 of the rotation of the earth. The building is quite impressive – at least we think so, on our visit it was home to a huge art installation, with enormous hanging sacks (they looked like socks) filled with polystyrene balls and sand. If that sounds weird – it was. Apparently we were being “invited to contemplate a confrontation between nature and culture”. Hmmm. The Cluny Museum, aka the National Museum of the Middle Ages, was our next stop. As we seem to have spent a lot of this holiday in the middle ages, it seemed logical to go there, but we would have anyway, as it’s a magnificent collection, and home to the famous Lady & the Unicorn series of tapestries, as well as sculptures, jewellery, religious objects, gold, and stained glass. The museum itself is housed in old Roman baths and a 15th century abbey. After another café stop to recharge the batteries, we headed for the Louvre. It is open till 9.45pm on Fridays, so we thought we could avoid the crowds by going late – but someone had told others about the late opening, so there were a few people there! Knowing it is impossible to see everything in one visit, we thought we’d make sure we saw the highlights. We took our own guided tour, courtesy of Rick Steves (he has several Paris walking audio tours on his website). It was a struggle to walk straight past great works of art, but we did manage to get through the tour and saw some incredible sculptures and paintings. And we were so expecting to be disappointed by the Mona Lisa, that we weren’t! Having Rick with us helped a lot, as he pointed out aspects of the works that we would not have noticed, and filled in some art history we were ignorant of. (By the way we are not the only Ricknics around – we often have overheard people saying “Rick says …” and fellow Ricknics wave their books at us with a knowing look). We ended the day with a short stroll to the Pont Des Arts for another sit watching the boats on the Seine, the sparkling Eiffel Tower, and the people. Today we entered the next phase of the trip, as we returned the rental car and left rural France for Paris. For the rest of the trip we will be in big cities, and coping with public transport. We are excited and looking forward to seeing some of the world’s great cities, and happy not to be driving on unfamiliar roads on the wrong side of the road, trying to cope with inadequate maps (we were too mean to buy a decent one), sparse road signs, and a disappointing GPS. On the other hand we have really enjoyed the little towns and different regions we have been through, and the people we have met through the B&Bs, not to mention the peace and quiet. Our last stop before returning the car was in Honfleur, at the mouth of the Seine, said to be the home of impressionism. The small square harbour filled with pleasure craft and surrounded by tall narrow buildings with colourful awnings has been (and still is) the subject of many paintings. We had a lovely stroll around the harbour and then found a spot at an outdoor café with a lovely view and had soupe de poisson for lunch (sounds much more interesting than fish soup). Behind the harbour are lots of little pretty alleyways to explore (next time). We did call in to the unusual church of St Catherine, which clearly was designed by a community of sailors and fishermen, with plenty of boat builders, but no cathedral architects. The timber ceiling looks like the upturned hull of a boat. And the bell tower is across the square, as it was too heavy for the timer church. Our next challenge was to return the rental car in Rouen. No worries we thought – this time we made sure the car hire company was at the railway station. So after many wrong turns, and an unplanned scenic tour of Rouen (very unusual cathedral, with unmatched spires, one made of cast iron - this is the cathedral which Monet famously painted numerous times) we finally reached the railway station, whereupon we had another, less scenic drive trying to find the Europcar drop off. Finally, in desperation, we asked for help, and found it: inside the pay car park & out the other side then down 3 floors – you can’t miss it! The train trip was uneventful and fast (and much cheaper than in England) and we arrived in Paris. Several flights of stairs later (with 2 heavy suitcases – haven’t these people heard of escalators) we negotiated the Metro and found our hotel. At the price we are paying (the second most expensive place we are staying at, but very cheap for Paris) we didn’t expect much and found less. But the bed is comfortable, the location is good, and I haven’t seen any rats or fleas (yet). We don’t plan to spend much time in the hotel anyway. Today we visited a more recent period of European history, leaving the Middle Ages for a change we spent the day in World War II, especially D-Day. Graye-sur-Mer, where we are staying, is very close to Juno Beach, and the whole north coast of Normandy is a monument to the D-Day landings. We started at the Circular Theatre in Arromanches, a clever 360° cinema featuring archival footage taken by war correspondents interspersed with peaceful scenes of the Normandy countryside today. With no dialogue, but plenty of sounds its quite an emotional experience – the effect of real gunfire in surround sound is quite a shock. Outside the cinema there’s a lookout, and we had our first sight of what’s left of Mulberry harbour, the huge artificial harbour that was built on floating cement pontoons. It’s hard to comprehend the scale of that operation! We had a little stroll along the beach, looking at the rusted bits of war machines in the water, grateful that the only sounds we could hear were the waves and the seagulls. We visited the American Cemetery, where just under 10,000 soldiers are buried in immaculate rows of neat white marble crosses and Stars of David. The area is immaculately maintained by the French, I have never seen such well-tended lawns. We saw several lawn-mowers in action – it looked like a never-ending job. It’s hard to remain unmoved by the sight of so many lost lives. Apparently each family was given the option of bringing the body home for burial, and so there is a disproportionately high number of officers buried there, because their families knew they would want to be buried with their men. Next stop was the Caen Memorial, officially called "History to Understand the World". It is an amazing museum, with a huge amount of information on WWII and conflicts since then, with a strong message of hope and peace for the future. We watched some impressive footage about the D-day landings, with before and after images of many towns in the area (including Caen itself, which was 80% destroyed). The architecture of the building itself is very impressive, it’s a huge museum and you would need several visits to do it justice. It’s such an emotional subject, there really is only so much you can take, and take in. There was a display of letters home, written by French, English American and German soldiers which was extremely moving, as you’d expect. One letter was written by an American to his parents, dated 5th June 1944, saying if they were reading the letter then it means he had not returned, and saying his goodbyes. It didn’t say exactly what happened to him, but the latter had been posted. We were planning on staying until it closed, but we just could not absorb anything more. As breakfast wasn’t served until 9am, our plan was to go down to watch the sunrise at Mont St Michel and with any luck get some nice foggy photos (the sun doesn’t rise until 8.13am, so not as noble an intention as it sounds), but in the end we didn’t wake up in time. Oops! We arrived at around 10, to discover we were not allowed to park on the causeway, but had to park on the mainland – and walk 1.8km to Mont St Michel. Walk!! 1.8km!! And back again at the end of the visit! Our feet were aching in anticipation. Turns out if we’d arrived a bit later we could have parked on the flats which appear at low tide – but bye-bye car if you over stay and the tide comes back in! However we did manage the walk and there was still a bit of fog for our photos. And we were very glad we did. The Abbey of Mont St Michel is on the top of the island, below is a village (mostly hotels and restaurants). You enter by the old gate, and walk up the single narrow cobbled street, lined by tacky souvenir stalls and expensive restaurants. Could be off-putting, but its kind of authentic, because in the middle ages pilgrims coming to the abbey would buy souvenirs of their visit, so nothing much has changed. After climbing a few million large stone steps (well, the top is 80 metres above the sea) you enter the abbey, a wonderful, light-filled, building, part Romanesque (11th century), part Gothic (16th century). We arrived as a small group of monks and nuns entered the abbey to do whatever monks and nuns do, and were entertained (though I doubt that was the intention!) by their wonderful singing – clearly you need to be able to hold a tune to enter this order. Under the church there is a huge monastery, with some enormous rooms supported by pillars, and under that the “crypts” – huge foundations built to support the abbey & monastery. The feat of medieval engineering, such substantial buildings perched on the top of a small rocky outcrop in the ocean, was impressive to say the least. After buying an ice-cream to fortify us for the long walk back to the car, we reluctantly left Mont St Michel for the long march back to the car. By then the sky was blue and clear and the sun was in just the right spot for photos, so that was our small consolation. By the time we got away it was later than we had hoped (2 unexpected half hour walks didn’t help), and we got to Bayeux with less than an hour to see the famous tapestry. We didn’t have time to look at the associated exhibition, but were really thrilled to see the actual Bayeux tapestry itself. Something so familiar that we have known about since childhood – it was quite a thrill to see the real thing. It’s in remarkably good condition, with rich colours and huge – 70 metres long. We listened to the inevitable audio tour which explained and pointed out details in each scene which we would have otherwise missed – it added to the experience significantly except it went at a much faster rate than we would have. As we left we walked past the cathedral, which was quite spectacular in the setting sun. It was Odo, bishop of Bayeux, who commissioned the creation of the tapestry. We had about a four hour drive ahead of us today, and since Keith has to do all the driving, we wanted to allow plenty of time. So, much to our discomfort, we decided to limit ourselves to one Loire Chateau. We chose Chenonceau, because it was close to where we were staying, and because Rick said so. He also warned us that it is very popular, so we headed off early and were there before it opened. It was rather chilly (6°!) but we were congratulating ourselves for beating the crowds – until 2 huge tour groups arrived 5 minutes later! But we used the audio tour so reversed the order, and more or less had the place to ourselves. The audio tour was on an ipod, which worked very well, and was nice and small to carry with us. It is certainly a lovely building, with its arched bridge stretching across the river (the Cher, not the Loire), and it had a fascinating history. They call it the chateau of the ladies, because several women were very influential in its design and building, and at various stages in its history. Even its recent history was fascinating. In WWI it was used as a military hospital, and in WWII the bridge enabled people to cross the river, one side of which was in Occupied France, and the other side was Vichy France. After a wander around the formal gardens (just in time – the gardeners were viciously pulling up all the flowers in one garden, ready for next springs plantings, I suppose, but they looked quite healthy to us) we headed for Mont St Michel. We made good time (the motorways are expensive but so pleasant to drive on if you are going a long way) so were able to stop in Fougeres, which contains the largest medieval castle in Europe. It was too late to enter the castle, but we had a nice walk on the ramparts, and drove up some perilously steep and narrow streets to a park which gave great views over the castle and town. Unusually this castle is at the bottom of the hill, but is still surrounded by the original moat, and was a very impressive sight. You’d think by now we’d be getting sick of castles, but each one we have seen is different and adds to our knowledge of history and times long gone, we can’t get enough of them! Fougeres also has some lovely medieval streets with the crookedest houses I have ever seen. We still made it to MSM before dark and as it looms high above the countryside we had to go and have a look before we checked in to our B&B. Just as we arrived the sun broke through the clouds (it poured with rain while we were at Fougeres) and we enjoyed the late afternoon light on the Mount. After dinner we went back to see it floodlit – it’s a magnificent sight! From the sublime to the obscene – we left Sarlat today to drive to Amboise, in the Loire Valley. On the way we visited the town of Oradour-sur-Glane. This town was the scene of a massacre of the entire village by the Nazis on June 10th 1944, when they rounded up the entire population, men women and children, and machine-gunned them and then set fire to the bodies and the village. The town was left as it was, as a memorial to the 642 who perished that day. There were a small handful of survivors. It’s very moving to wander along the streets, seeing the burnt out houses and businesses, with evidence of shop fittings, burnt-out cars and bicycles, and (for some reason) sewing machines. In the church, where the women & children were killed, the walls are riddled with holes from machine-gun fire. Each building carries a plaque with the name of the owner and his/her occupation - it was clearly a thriving town, with lots of cafes, hotels, hairdressers and couturiers. We spent a few hours at Oradour, and certainly left in a sombre mood. The rest of the day was spent driving, apart from a brief photo-stop in Amboise as we passed through. The castle was just catching the last rays of the setting sun, and looked quite splendid. The Loire valley is lovely, but we only have an overnight stop here, so we won’t get to see much of it. Saturday is market day in Sarlat, and we had made sure that we would be here on a Saturday. Market Days are a big deal in rural France, and nowhere more so than the Dordogne. The whole of the Old Town is closed to traffic and there are market stalls everywhere, selling everything from fresh farm produce to exotic liqueurs to clothes, books and bric a brac. We enjoyed the food stalls the best – poultry (especially duck), meats, pâtés, cheeses, sausages, cèpes, garlic, strawberries, spices, and everything made from walnuts (cakes, biscuits, cheeses, liqueurs, oils, vinegar, soap, caramelized walnuts, chocolate-coated walnuts…). It was fun wandering around, having strange conversations in (our) broken French, and tasting food fresh from the farm. We bought ourselves a delicious lunch at various market stalls (pâté, cabécou, baguette, strawberries & spiced honey cake) and headed back to La Roque-Gageac for a river cruise. They use boats called gabares, based on the old flat-bottomed boats used in the days when the Dordogne River was the main transport route for the area. The cruise was only one hour but gave a different view of some of the places we visited yesterday, and the guide filled us in on the history of the river and the town of La Roque. After the cruise (at about 4pm) we sat by the riverbank and enjoyed our pique-nique, accompanied by some Bergerac wine. Bon appétit! From the boat we had seen another lookout which promised yet more spectacular views, so when we finally had enough of sitting in paradise we headed up the hill. We didn’t quite make it to the lookout (it was in the grounds of a chateau, so cost money) but had a pretty good view from the car park. As we looked we saw two montgolfières (hot air balloons) about to take off, so stood for a while and watched them – a magnificent sight, and something I’d love to do one day – if they could figure out a way to fly and stay on the ground at the same time. If I was tempted, this neighbourhood would certainly be the place to do it – the scenery is just sensational (or did I mention that already). Apart from food this region is famous for its concentration of pre-historic artifacts and cave paintings. Since there was a dense fog we figured underground was the best place to spend the day. The most famous cave is Lascaux, but we decided with limited time we wanted to see the real thing (Lascaux is closed for its protection, the one you can visit is a copy) so we went to 2 local caves, Font-de-Gaume and Rouffignac. We went first to Font-de-Gaume to book a tour (numbers are strictly limited) then drove to Rouffignac where we were warned we would probably have to wait. However as we walked in a tour was just about to start (the last tour of the morning – everything closes here for lunch) with only 3 other people, so our timing was impeccable. The guide said because we were such a small group she could show us things not normally on the tour. The guide spoke only French, but one of the others was an American French professor who has retired to live in France, and he did a great job of translating for us. Rouffignac is a deep cave complex – you travel on a little tram 3 km into the caves to see amazing paintings and carvings of rhinos, bison, reindeer, horses, ibex and mammoths. Fascinating, and spine-tingling to realize how old these paintings are – about 15,000 years. Pictures of mammoths – an animal that has been extinct since the end of the ice age, depicted by people who knew them first hand! After lunch in Les-Eyzies-de-Tayac, the local village built under the overhang of a huge cliff, we went back to Font-de-Gaume for our tour. In French again, but the guide spoke very clearly and we actually managed to follow him pretty well. Font-de-Gaume is the only cave in the world where you can still see multi-coloured cave paintings (the others are Lascaux, and Altamira in Spain, which are both closed to the public). The impressive thing is not just that these paintings are mind-blowingly ancient, or that they have been preserved so well, or what they tell us about prehistoric people, but they are really beautiful works of art. And they show skill with realism and perspective that wasn’t rediscovered until the Renaissance. At the end of the tour the guide thanked the group for our attention but also for our attitude, and it really did feel a tremendous privilege to be able to see these paintings first hand. The Musée National de Pré-Histoire in Les-Eyzies has a huge collection of prehistoric artifacts and rounded off our prehistoric day nicely. It’s a surprisingly modern well organized museum. There were a number of videos demonstrating ancient techniques of rock carving and tool-making, and thousands of arrow heads, skeletons and other bits and pieces. Back to Sarlat for another wander – the town is floodlit at night - and another gourmet dinner, though this time we settled for one course. We had an assiette (mixed plate) so we still got to try a few local delicacies. Shelley ate a salad of walnuts, lettuce and goose gizzards. (I have no idea what part of the animal that is, and I don’t want to know, but it was delicious). !!! HAPPY BIRTHDAY ROB !!! Early start today – we caught the tube to Waterloo Station to catch a train to Southampton to catch a plane to Bergerac to drive to Sarlat. Left the flat at 7:45 and arrived in Sarlat at 4pm. Actually it all went very smoothly until we arrived in Bergerac. I think it might be quite a small airport – we arrived 15 minutes early, having caught a good tail wind, but had to wait to get off the plane until the only set of stairs was no longer being used by the previous flight. Even the pilot seemed somewhat surprised. The “terminal” was a shed (literally), and the rental car outlets were in demountables out the back. Still – no crowds, the luggage was waiting for us, and ‘passport control’ was a woman standing at the door with a rubber stamp. We picked up our car (another Megane – very nice) and headed for Sarlat. Unfortunately because Shelley’s driver's licence was in her stolen wallet Keith has to do all the driving, on the wrong side of the road of course, so it was a steep learning curve for both of us! Sarlat is an absolutely delightful little town. It has a mediaeval centre which is a tangle of cobblestone alleyways and ancient buildings, hidden squares, gothic doorways and enticing cafes. We spent a happy couple of hours exploring the town. There are very few tourists here, and we have enjoyed the serenity after London. Our last day!! We found London fairly tiring – we were very busy ourselves, and walked for miles every day. But London itself is exhausting, I think – everywhere is crowded, and people are always rushing, in a hurry to get who-knows-where. But our last day dawned sunny & clear, so we were eager to get out and enjoy the day. We still had a few hours left on our bus tour (the tickets are valid for 24 hours) so we picked up where we got off yesterday, and finally finished up at Hyde Park Corner. We had a look at the Australian War Memorial (very modern, but quite moving) then walked through Knightsbridge (very classy – read expensive – shops) to Harrods, the famous department store, where, they claim, you can buy anything you want. They certainly have some impressive items – I spotted a jewellery case I quite liked, till I saw the price (₤899.00); or a “toy” Hummer for kids, about 1/3 life-size, with an engine that went up to 15 miles an hour – a steal at only ₤6000 – I would have bought one for all my friends, if it wasn’t for the weight limit on my luggage. The décor is incredible – pure kitsch from top to bottom, including the Egyptian escalator, with hand carved sphinxes featuring the face of Mohammed El Fayed, who owns Harrods. The food hall is quite fantastic, an incredible range of delicacies in wonderfully decorated rooms. We bought a filled baguette at Harrods (the only thing we could afford!) and took it to Hyde Park for a little picnic. We sat by the lake watching the geese and resolutely enjoying ourselves, despite the fact that by now it was really cold, blustery and rain was imminent. We walked through the park to the Albert Memorial, which is much bigger than we realized, incredibly gaudy but impressive at the same time. Queen Vic must have really missed her hubby. We also passed the new Diana, Princess of Wales Memorial Fountain, which we thought was particularly underwhelming, looked like a storm drain really. Since it was actually raining now, we headed for cover and popped back to the V&A. It was a nice way to finish our time in London as we had started it. We have been very busy in London, and have enjoyed each day, but this morning realized we only had 2 days left and we hadn’t visited many of London’s most famous places, such as St Paul’s Cathedral, the Tower of London, the National Gallery, Trafalgar Square… As we keep saying – plenty to do on our next visit. But still, we felt we ought to at least lay eyes on these places so we bought a ticket for one of those Hop-On Hop-Off open-top double-decker buses. Very touristy, but probably the most efficient way to “do” the highlights. And in fact we did enjoy it. You get a very different perspective from the top of a bus – you see over all the cars and people in the streets and notice the buildings and landmarks much more. We ‘hopped off’ at Trafalgar square but the fountains were turned off while the filters were being cleaned, and Nelson’s Column was surrounded by construction fencing as well, so we hadn’t missed much there! Our next hop-off was Buckingham Palace, where we peered through the gates with everyone else. A flurry of excitement was generated in the crowd when a horse-drawn carriage with 2 formally attired footmen drove through the gates, but I doubt if it was anybody royal, given the lack of security. We had lunch and got back on the bus, by which time it had started to sprinkle, and then pour. Our luck with the weather has run out a bit in London (not that it matters much here). Nearly every day here has started out sunny, but there has been rain and very dark clouds at some stage of every day. Fortunately the open top of this bus was partly enclosed, and we continued in the rain. We decided no more hopping off however. But by 5 it started to clear, just as we reached the Tower of London, and the Tower Pier. The bus trip included a Thames River Cruise, so we got off for the last time and managed to catch the last cruise of the day, which went down to Greenwich and back to Westminster Bridge. The sun came out and we spent an extremely pleasant 90 minutes. The trip to Greenwich goes past the old docklands area, which is now the site of hundreds of very expensive warehouse conversions and waterfront apartments, interspersed with very old pubs and sites of historical interest, such as the Pier where Elizabeth I knighted Sir Francis Drake, and the area where provisions were delivered during the Black Death, when no-one dared enter London itself. Our guide was born in Greenwich and has worked on the river for over 50 years and knows every brick and canal like the back of his hand. He also had a great sense of humour, and made the trip especially entertaining. We disembarked & walked to the Victoria Palace Theatre, for our last (and best) London Show – Billy Elliott. It’s a musical based on the film, with music by Elton John. Fantastic show – very funny & very moving, with some amazing dancing. I hear it’s coming to Oz soon – don’t miss it! Since we had to replace our stolen train tickets to Southampton we thought at the same time we could do another pilgrimage – this time to Platform 9¾ at Kings Cross Station, where Harry Potter went each year to catch the train to Hogwarts. And there it was, between platforms 9 and 10, as you would expect! His luggage trolley is stuck half way through the brick wall, as though he’s just left for school. We had arranged to meet Shelley’s sister and family at an historic house-come-museum called Burgh House, in Hampstead at midday, and had half an hour to spare, so we ducked into the British Library, which was just next door. Ho-hum I hear you say, but this is no ordinary library. Amongst its collection are original copies of the Magna Carta, earliest printed copies of some of Shakespeare’s works, original manuscripts by Jane Austen, Charlotte Bronte, Charles Dickens, Lewis Carroll, to name a few, ancient maps, beautiful medieval illustrated manuscripts, Beatles song lyrics scribbled on restaurant serviettes. Also rather poignant was the journal of Scott (of the Antarctic), opened at his final entry before he and the last of his team died in his hut in a blizzard. All so fascinating that we had to come back again after lunch with the family, this time until we thrown out at closing time. Hampstead is a lovely suburb, once a favoured retreat for generations of artists and writers - worth coming back some time just to wander around (when it is not raining). Burgh House is now a museum of the history of the Hampstead area and is quite fascinating. There is a new movie called ‘The Queen’ which has just opened here, and since we were in London it seemed the right thing to do to go and see it. It stars Helen Mirren as Queen Elizabeth II, and is about the week following the death of Diana (former) Princess of Wales, and how it affected the royal family, and the relationship between the Queen and Tony Blair. It was very well done and gave an insight into what went on behind what was depicted in the media. Not sure how much of it was ‘fictionalised’, we found it interesting that it was portraying current public figures. We’d give it 4½ out of five. Whose idea was it to go to watch the Grand Final at a pub at 5.30am? Not our brightest. We were up at 4, caught the night bus to Finchley & were at the pub before it opened. We went early in the hope of getting a good seat. The queue was already a block long, so by the time we got in there was no chance of any seat at all, let alone a good one. As we were twice the age of everyone else we were kind of hoping someone might take pity on us, but there was no chance. The screen was dodgy – the picture kept fading to a foggy blur, and they ran out of breakfast (included in the price). Silly us – we thought if they were selling a limited number of tickets for the event, they might provide facilities for that many people. And the Swans not playing very well at that stage, and Swans fans were badly outnumbered! So we decided to cut our losses and go back to the flat where we could listen to the radio broadcast online. Of course it was raining when we came out of the pub, and someone hadn’t brought any umbrellas. When we got home we got to listen to all the ads during half time, and then lost our connection, and couldn’t get it back for the whole rest of the game!! Helen (Keith’s sister) sent us score updates, and we got our hopes up but you know the result. All up not the best morning for us!! After a nap we headed for Portobello Road markets, a popular Saturday browsing spot. Lovely antiques, didn’t buy anything, but enjoyed “window”-shopping & people-watching, especially when it rained, as it did several times. Sat in an outdoor café for lunch, only getting slightly dripped on. Our legs were still suffering a bit from the previous 2 days so we were hoping for frequent sitting spells today. When we decided we’d had enough of the crowds we wandered away from the markets into Notting Hill, which is a lovely neighbourhood (made famous by the movie) of attractive large 19th century terrace houses. Many of the houses back on to lovely private “gardens” – gated parks which run the length of the block and form wonderful oases of green, and to which only the privileged few are admitted. After another ‘coffee’ break we caught a bus to Kensington Gardens for a wander. It’s a lovely, large semi-formal park with avenues of huge trees, and a large pond complete with swans, geese and ducks, and surrounded by green & white striped deck chairs that you can hire to while away a few hours. As it had been raining most of the day these were unoccupied but the sun was shining and there was a wonderful rainbow over the pond. There is more to see in Kensington Gardens (such as the famous Peter Pan statue) but at that point I realized that my wallet had been stolen from my bag at some point during the day. We rushed back to the flat in the vain hope that maybe I had left it behind, and spent the evening phoning various authorities to make reports. There wasn’t a lot of value in it (except our train tickets to Southampton worth ₤52) but it’s never a nice feeling. It could have been much worse, I didn’t lose anything of real value and it’s all insured. Everyone has a robbed-while-travelling story, hopefully that was ours and it won’t happen again! So the day started and ended badly, but was very pleasant in between! One of the places we were both looking forward to visiting was Bath. We had planned to go while we were in the Cotswolds, but we found out that the Jane Austen festival was on that week, and even though we are both JA fans, we thought a town full of Janeites might be a bit much for dedicated crowd-avoiders like us. Instead we headed off by train from London. We were not intending to pre-book the train tickets, in case of bad weather, but that was before we found out how expensive British trains are! Pre-booking reduced the fare from ₤114 ($272) each (!!) to ₤45 ($107), so we didn’t really have much choice. So – surprise, surprise – the day dawned very wet, and really bucketed down most of the day. However, “there’s no such thing as bad weather, just inappropriate clothing”, so we remained resolutely cheerful and had a wonderful day. First stop was Bath Abbey, said to be England’s last great medieval church (1499) and known for its stunning fan-vaulted ceiling and unusual stone carvings of angels ascending to heaven on a ladder. Some of them appear to be heading in the wrong direction, however. It also contains, we discovered, below an Australian flag, a memorial to Arthur Phillip, who died in Bath in 1814. Next door to the Abbey are the famed Roman Baths, still today fed by the same underground spring and using the same plumbing that the Romans built so long ago. They had fallen into disrepair at the decline of the Roman Empire, and had become silted over. They were excavated in the 1880s and all sorts of interesting items were discovered, which are now very well displayed. For example evidence that the Romans believed that the earth was round. We enjoyed the exhibit, and then joined a (free!) guided tour of the Baths themselves. We weren’t going to, because we prefer to go at our own pace, but this particular guide was so good he got a spontaneous round of applause at the end. He completely transported us back to Roman times, and got so excited showing us various little grooves and markings in the stones, and what they meant, you couldn’t help getting caught up in his enthusiasm. A man who most definitely enjoys his work. We spent longer there than we intended, but it was worth it. Attached to the Baths is the Pump Room, since 1795 a place for “taking the waters”. In Jane Austen’s novels, it is the place to go in Bath, so it was a bit of a pilgrimage for Shelley to be there, and we decided to splurge and stay there for lunch, under the watchful marble eyes of Beau Nash, who was master of ceremonies in Bath (1705-1761) and established it as an elegant Georgian destination. It’s a lovely stylish room, essentially unchanged since JA’s time, and the lunch was excellent. By the way – yes, we tasted the water, and yes, it was horrible! By the time we left the Pump Room it was after 3pm, and we realized we weren’t going to “do” Bath in one day. We constantly have the conundrum of whether to see a few places in depth or push ourselves to see more. There are benefits either way, but our natural inclination is to immerse ourselves fully wherever we are, so that’s what tends to happen. Oh well, plenty to see when we go to Bath next time. In our defense, it really rained heavily while we were in the pump room, but stopped by the time we left, so it was time well spent. We had a pleasant walk past the magnificent Pulteney Bridge over the Avon River (said to be inspired by the Ponte Vecchio in Florence) up to the Royal Crescent, the address in Georgian times as it is today, and the Circus, both graceful curved terraces of grand houses reflecting the best in Georgian architecture. One of the houses is set up as a museum, but we’ll have to go there next time. Nearby is the Assembly Rooms (aka the Upper Rooms), the hub of the Bath social calendar in the 18th century, where they held balls, card parties and musical evenings. Very elegant, beautifully restored (there wasn’t much of it left after the Blitz). It also houses a museum of costume – fashion through the centuries, some amazingly well-preserved outfits hundreds of years old, and some pretty ordinary modern ones! By then it was 5.30 and we had missed out on the Jane Austen Centre, but finally the sun was shining so we just enjoyed walking around the streets. We strolled along a path by the river which was really pretty and caught the train back to London (after a “cream tea” in the pub near the station). Another exhausting but very enjoyable day. We must be getting fitter, we are walking for literally hours every day.